Wild rice lends added flavor and color to many recipes, including soups, salads, stuffings, casseroles, desserts and more! 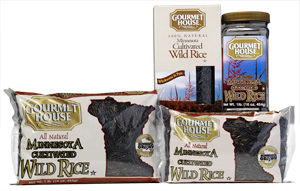 For convenience and versatility try, Gourmet House® Quick Cooking Wild Rice ... ready in only 5-minutes!! Add more whole grains to your diet with Gourmet House Cracked or Cultivated Wild Rice. Perfect for that extra special touch to your favorite recipe.